Our middle daughter Hopie has always wanted to be married since as far back as I can remember. 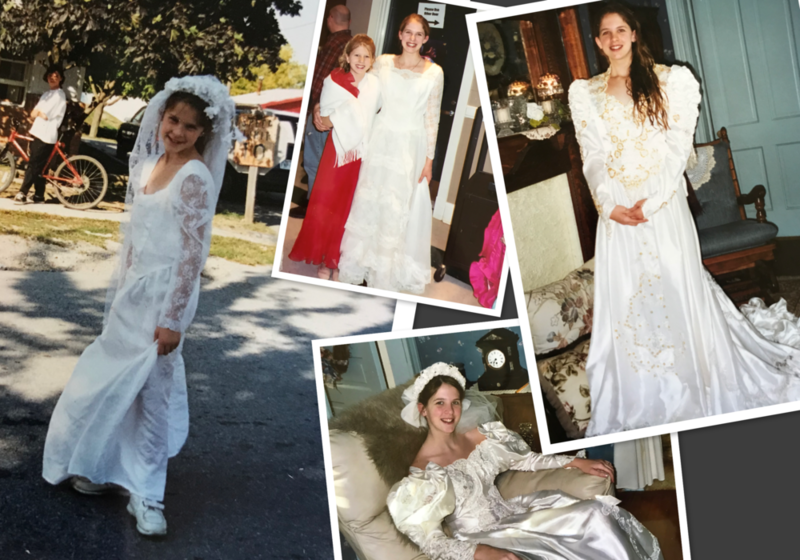 As a matter of fact she started picking out and wearing wedding dresses more than twenty years before her big day at the alter came this past fall. The first wedding dress I remember Hopie having and wearing, she was probably six or seven and talked me into buying it for her at a garage sale. She wore it riding her bike every day after school. From then on, she seemed to always have one and found occasions to wear it… family dinners… walks with her dog Bonnie… and just about any day of the year was a good enough reason for her to be a ‘bride’! So this past summer when our wonderful friend Manuel offered to design her a one-of-a-kind dress for her wedding, Hopie was over the moon. And she looked so beautiful in it surrounded by her bridal party. ﻿Another thing that Hopie has always loved is camping. Since she was a teenager, every chance she gets, she heads to Henry Horton or some other campground nearby to pitch a tent and build a campfire. So as her wedding date got closer, I had an idea for a wedding gift that Russdriver helped me make happen. Online, we found a 1962 Sprite vintage camper that had been lovingly restored by a wonderful couple in Manchester. They had tears in their eyes when we paid them and drove away with it behind my truck. I wanted to surprise Hopie and Wendy… so the night before the wedding, as their rehearsal dinner in the concert hall wrapped up, we had them come outside to practice driving away from the reception (Hopie had asked if they could use my ‘54 Olds Rocket 88 as their getaway car). 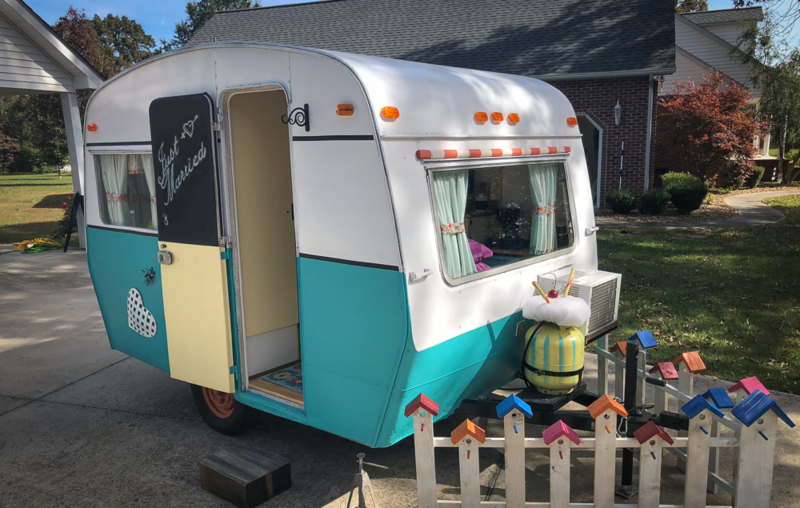 But when they got outside, we had their new, old camper attached to it. They had absolutely no idea, and were so surprised and excited! It was a perfect moment that was part of a perfect day that Hopie had been waiting her whole life to experience. This past June, I shared a blog post about a difficult conversation I had in March of 2015 with Hopie, just a day or two after Joey’s funeral. And some of the things I’d come to learn in the following year or so, when Hopie called me one day and said that she was engaged… to her girlfriend Wendy. It was an important chapter in a book that I had written called Once Upon A Farm, and an even more important chapter in our family’s story and this life that I’m living. This is a confusing and divisive subject and story for lots of people and I understand that how I, or our family have chosen to love Hopie and Wendy and honor their choices is probably different than a lot of other folks would have done. And that’s okay. For me, it isn’t about taking a stance on incredibly complicated issues or thinking that the decisions we make are the ones that others should. It’s just about loving Hopie. And Wendy. And Heidi. And Indy. And them loving me, even when they don’t completely agree with me or understand the choices I make. And so in late October, we had quite a celebration at our farm. It had been raining on and off for days and we were worried that it might get moved inside. But a half-hour or so before the ceremony, the rain stopped, the clouds cleared, and made way for all the family, friends and guests to gather in Joey’s garden for Hopie’s special moment. Heidi was her maid-of-honor and Indiana was the flower girl. The wedding celebration happened a couple of months ago, and I haven’t shared about it til now. Not because I haven’t wanted to, but because it took us awhile to find time to put the footage together so I could share more than just a few pictures and this story. Heidi and Dillon (along with Scout’s mama Mandy McCauley) wrote a special song for Hopie and Wendy called “More Than A Man and a Woman”. It was perfect for their special day. And I think it’s perfect for this one too.